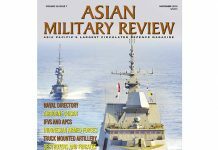 This is the April/May 2018 issue of Asian Military Review. This is not the latest issue. 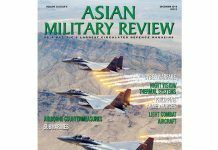 Air Power: Sounding Warnings Sooner: Alan Warnes examines the wider adoption of more capable airborne early warning systems in Asia-Pacific. Land Warfare: Tactical Change Of Tune: Better communications compatibility is now a focus for forces in Asia-Pacific. 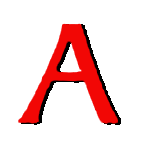 Software Defined Radios have also been recognised for their upgradability as JR Ng finds out. 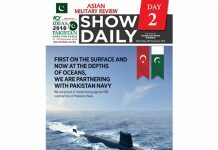 Sea Power: Fast Attack: Still A Threat In The Littoral: Fast attack craft have replaced torpedoes with missiles to remain a threat. Land Warfare: Combat Vehicle Modernisation: Modernising combat vehicles does not simply have to remain in the domain of the OEM, as Steve Miller explains. Land Warfare: Coastal Watchkeepers: With piracy and smuggling joining economic zone intrusion, JR Ng finds unmanned observation systems are coming to the forefront of coastal security. Land Warfare: The MRAP Story: Learning From History: Stephen W Miller traces the development of the MRAP from early vehicles deployed by the South African Defence Force. 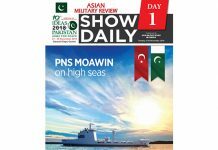 Regional Militaries: Greater Potential Pending: The Malaysian Armed Forces retain a broad range of capabilities across land, sea and air. Modernisation remains hampered by a lack of budget cohesiveness, reports Dzirhan Mahadzir.